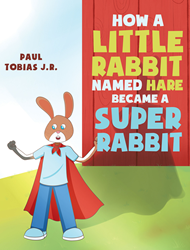 Recent release “How a Little Rabbit Named Hare Became a Super Rabbit” from Page Publishing author Paul R. Tobias Jr. is an enthralling tale that teaches lessons on courage and strength in facing challenges and obstacles in life. Paul R. Tobias Jr., a prolific writer and author of children’s books, has completed his new book “How a Little Rabbit Named Hare Became a Super Rabbit”: an illustrated opus of a young rabbit named Hare as he saves lives and aids those who are in distress by becoming the hero they need. Published by New York City-based Page Publishing, Paul R. Tobias Jr.’s delightful read also features a wonderful lesson on respecting officers of the society and making them as an example of good excellence and proper decorum that children and the youth must heed to. Readers who wish to experience this engrossing work can purchase “How a Little Rabbit Named Hare Became a Super Rabbit” at bookstores everywhere, or online at the Apple iTunes store, Amazon, Google Play, or Barnes and Noble.